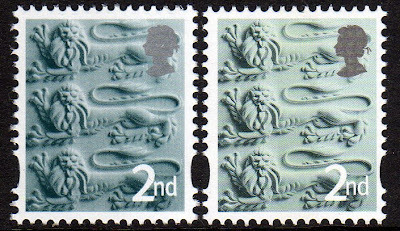 Silver head missing on new England litho-printed 1st & 2nd class stamps. 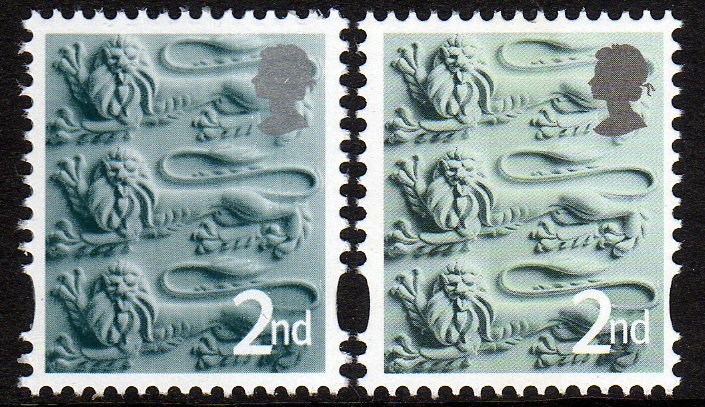 We received the new litho-printed England and Wales 1st and 2nd class stamps in November, and posted all the details here. Somebody has since asked why there is no silver cylinder on the England stamps, as there was on the Scotland stamps issued in the summer. I concede that with everything else going on I hadn't noticed the missing cylinder number (properly 'plate number' as it is litho). Here are the C1 numbers in yellow, magenta, cyan and black with phosphor above the yellow. The Wales stamps of course have the Queen's head reversed out of the colour printing so it appears white. But the England stamps have the head in silver - or do they? Well in fact no. Although in this scan the head on the right could easily be silver it is, in fact, grey-black. There is no silver on the new England stamps! This, of course, makes it very much easier to identify the Cartor stamps. 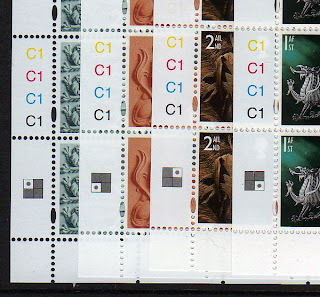 It must also mean that the 1st class stamp will have a new catalogue number as SG EN18 printed in litho by Enschede for the British Army prestige stamp book is "lake-brown and silver". The 2nd class has not previously been printed in litho. In fact this reminds me that the country definitives are an odd mixture. 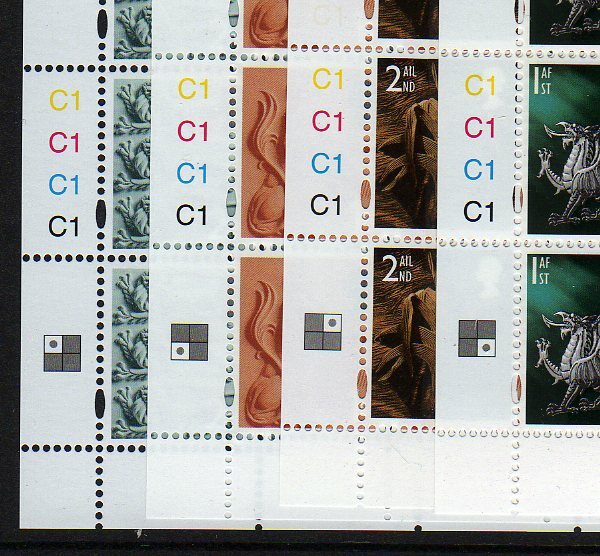 The Wales and Northern Ireland stamps have both head and value in white. The Scotland stamps have both head and value in silver. The England stamps have the head in silver (or grey-black), and the value in white!